Menstrual hygiene and breaking the silence surrounding menstruation, matters. To prove that point, in honor of Menstrual Hygiene Day on May 28, women around the world turned up the volume by tweeting messages of solidarity and attending events to normalize the still all-too-often taboo subject of menstruation and period pain. According to a YouGov poll, commissioned by ActionAid, more than one in three UK women, or 37 percent, have experienced period shaming. Even more surprising? Nearly half of those who have been period-shamed claimed their partner was responsible for the shaming. Last year, Itir Esen, who was crowned Miss Turkey, lost her crown after she tweeted about getting her period. "To celebrate July 15 Martyr's Day, I began the morning by getting my period. I am celebrating the day by bleeding, representing the martyrs' blood," the tweet read. Although Esen deleted the tweet and apologized on her Instagram account, she was still stripped of her crown. Women around the world, however, are continuing to swarm social media, to help change how the world views periods. Even newly-minted royal, the Duchess of Sussex, Meghan Markle, has lent her international star power to the period conversation. Rather than accept wedding gifts, she and Prince Harry asked guests to donate to the Myna Mahila Foundation, an India-based org that helps women access menstrual hygiene products and employment opportunities. In 2017 she traveled to India to meet with Myna Mahila volunteers and later penned a piece, “How Periods Affect Potential”. Meghan Markle, (above, right) visited the workspace of the Myna Mahila Foundation in India. "One hundred and thirteen million adolescent girls between the ages of 12-14 in India alone are at risk of dropping out of school because of the stigma surrounding menstrual health," wrote Markle. The United Nations Girls Education Initiative reported a girl who misses school because of her period is estimated to lose an average of two and a half weeks of school each year. That chronic absenteeism puts young women at a higher risk for dropping out—especially in places like Nepal where menstruating women are banished to scary, isolated "menstrual huts" until their periods are over. 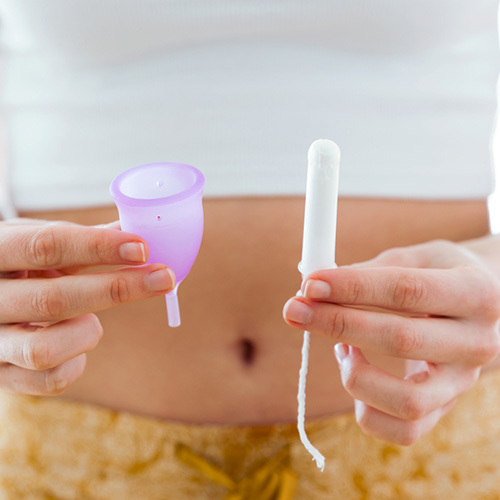 While women globally continue to struggle with period stigma and access to feminine hygiene products, the issue also lingers in the United States. According to a 2017 Teen Vogue article, homeless 23-year-old Taylor D., was living on the streets of San Francisco where she had to choose between eating or having enough money to purchase menstrual hygiene products. Her story, unfortunately, isn't unique. Tampons and pads continue to be the least donated items despite The U.S. Department of Housing and Urban Development Annual Homeless Assessment Report stating these products are among the most requested at stateside homeless shelters. Many women in the U.S. and around the world have to resort to wadding up toilet paper, paper towels or even layering old socks or rags inside their underwear during menstruation. Endometriosis advocate, actress and medical cannabis line, Whoopi & Maya, co-founder Whoopi Goldberg is also adding her voice to the movement, along with her partner Maya Elizabeth.